Artificial intelligence could provide a predictive score for the efficacy of cancer immunotherapy. 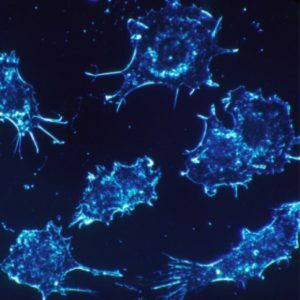 Researchers at Gustave Roussy, CentraleSupélec, Inserm, Paris-Sud University and TheraPanacea (Paris, France) have utilized artificial intelligence to establish a radiomic signature, which can predict the effectiveness of cancer immunotherapy. The findings were recently published in The Lancet Oncology. Only 15–30% of patients respond to PD-1/PD-L1 immunotherapy and there is no marker that can accurately identify these patients who will respond well. It is known that a high presence of lymphocytes indicate improved immunotherapy effectiveness. Therefore, in this study the investigators characterized the tumor environment using imaging and correlated this with the patients’ clinical response. Using an approach based on machine learning, the team used the CT images and RNA sequencing data of 135 patients with advanced solid malignant tumors who had been enrolled into the MOSCATO study to begin developing a radiomic signature of CD8 cells. The genomic data were used to estimate abundance of CD8 cells in the samples and data were then aligned with the images to generate radiomic signatures. The radiomic signature of CD8 cells was validated in three independent cohorts. First it was validated in a Cancer Genome Atlas database dataset, showing that imaging could predict a biological phenomenon and provide an estimation of the degree of immune infiltration of a tumor. In order to test the predictive value of this biomarker in terms of clinical outcomes, the team evaluated it using CT scans performed before the start of treatment in patients participating in five Phase I trials of anti-PD-1/PD-L1 immunotherapy. In patients treated with anti-PD-1 and PD-L1, a high baseline radiomic score was associated with a higher proportion of patients who achieved an objective response at 3 months (vs those with progressive disease or stable disease) and a higher proportion of patients who had an objective response (vs those with progressive disease or stable disease) or stable disease (vs those with progressive disease) at 6 months. Furthermore, a high baseline radiomic score was also associated with improved overall survival. The imaging biomarker could be useful in estimating CD8 cell count and predicting clinical outcomes of patients treated with immunotherapy, when validated by further prospective randomized trials. The next clinical study will assess the signature both retrospectively and prospectively and will use larger numbers of patients and will stratify them according to cancer type in order to refine the signature.